If you are a data scientist and want to explore the data and understand what is being saved and what the hierarchy of the folder is, please try Data Lake Explorer in VSCode ADL Tools. 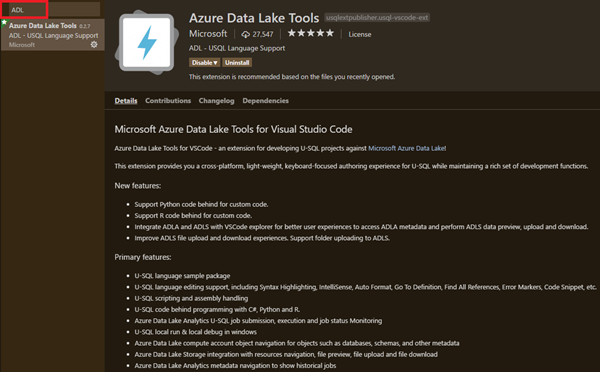 If you are a developer and look for easier navigation inside the ADLS, please use Data Lake Explorer in VSCode ADL Tools. The VSCode Data Lake Explorer enhances your Azure login experiences, empowers you to manage your ADLA metadata in a tree like hierarchical way and enables easier file exploration for ADLS resources under your Azure subscriptions. You can also preview, delete, download, and upload files through contextual menu. With the integration of VSCode explorer, you can choose your preferred way to manage your U-SQL databases and your ADLS storage accounts in addition to the existing ADLA and ADLS commands. If you have difficulties to login to Azure and look for simpler sign in processes, the Azure Data Lake Tools integration with VSCode Azure account enables auto sign in and greatly enhance the integration with Azure experiences. If you are an Azure multi-tenant user, the integration with Azure account unblocks you and empowers you to navigate your Azure subscription resources across tenants. If your source code is in GitHub, a new command ADL: Set Git Ignore has been added to auto exclude system generated files and folders from your GitHub source repository. Support Azure auto sign in and improve sign in experiences via integration with Azure Account extension. Enable multi-tenants support to allow you to manage your Azure subscription resources across tenants. Browse ADLA metadata and view metadata schema while performing U-SQL authoring. Create and delete your U-SQL database objects anytime in a tree like explorer. Navigate across ADLS storage accounts for file exploration, file preview, file download, file/folder delete, and file/folder upload in a tree like explorer. Exclude system generated files and folders from the GitHub repository through command.